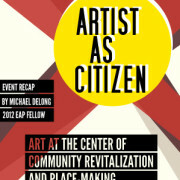 With topics such as creative placemaking taking center stage in discussions around the arts, the question of how artists engage as citizens offers a dynamic opportunity for exploration. On April 24, 2012, Emerging Arts Professionals/SFBA convened a panel in San Francisco at Intersection for the Arts around the topic of artistic citizenship. Joining the panel were a healthy mix of artists, curators, teachers, architects, and administrators that included Julio Cesar Morales, Jennifer Parker, Randy Rollison, and Lizzie Wallack, with moderator Sanjit Sethi. 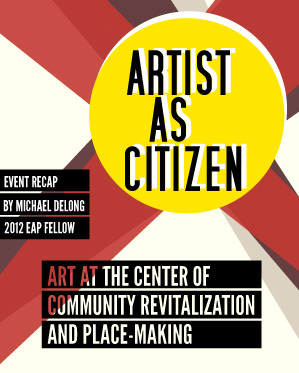 Born out of a series of discussions by EAP’s Public Programs fellowship, the event tackled a range of questions related to the role of the artist in the community. You can listen to the audio recording below and read on for highlights from the conversation. The engaged crowd warmed up with small group discussions, covering a number of key inquiries. Creative problem-solving and knowledge-sharing featured among these sessions, although pointed questions also sparked healthy debate. “When we invoke ‘the public’ we tread on tricky ground, and also run the risk of forced or awkward encounters between the public and art,” one guest noted, citing a recent instance of well-meaning but poorly executed mural-making in an underserved area. For many, murals in particular seem to symbolize the more uneasy aspects of community art initiatives, attracting questions around the role of artistic development in gentrification. What questions and practices can move us past such misgivings? Sanjit Sethi, co-director of the California College of the Arts Center for Art and Public Life, grounded the panel discussion by noting the Center’s interest in and critical inquiry into conversations around what community engagement means. Noting how fraught such terms as placemaking, collaboration, and community have become, he acknowledged the inherent risk that comes with practice in the public sphere, further defining risk as a level of extension towards a situation. As an example, Randy Rollison, Intersection for the Arts’ Innovation Studio Director, highlighted the risk that institution took in joining the 5M Project, a four-acre mixed-use development project in downtown San Francisco. Having built its reputation as a scrappy organization in various locations throughout San Francisco’s Mission District, Intersection opened itself up to the perception of mission drift by its long-term supporters. And even as the newly opened possibilities afforded by the move outweigh such risks, the endlessness of such possibilities, too, comes with the risk of burnout through overextension. When Jennifer Parker, Professor of Art and Digital Art and New Media, UC Santa Cruz and Co-founder of OpenLab, co-created Art Here with the Gray Area Foundation for the Arts in 2011, her goal was actually to reduce as much risk as possible. A hack-a-thon that led to a matchmaking tool for artists and communities, Art Here facilitated direct discussion between all stakeholders in the project, and aimed for broad use by schools and nonprofits with the ultimate goal of accessibility in mind. This intention helped address the risk of artists creating projects that landowners or communities were not interested in. Within the concept of citizen, whether paired with artists, designer, cultural practitioner, or even banker, is a component of responsibility. This responsibility particularly comes into play when artistic practice engages in the public sphere. Julio Cesar Morales, artist and Adjunct Curator at Yerba Buena Center for the Arts, took a class several years ago at the San Francisco Art Institute on the very topic of artist as citizen. “A lot of four-year and two-year art education programs train you to fail,” Morales said. They don’t train you to interact and become involved in your own neighborhood, making it crucial to build training for public engagement into art programs. In 2005, Morales started Queens Nails Projects in reaction to the dot com boom of a few years prior. Somewhere between a nonprofit and a laboratory, the space was founded to avoid the pressures of a commercial gallery while allowing artists to experiment freely and foment collaborations with surrounding entities. For Lizzie Wallack, Project Architect of ProxySF, a two-block project in San Francisco using renovated shipping containers to mobilize a flexible environment of food, art, culture, and retail, the sense of responsibility as an architect and designer is born from a sense of her own integration into the project. As a member of the very community the project serves, Wallack is both designer and client. As the discussion turned to the theme of collaboration, Parker noted the need for centralized hubs to share information and resources, most likely to emerge in the form of digital tools. Is digital placemaking the next big buzzword? It will be interesting to see what strategies emerge for tying together disparate work being done in this area, and who will take such work on. The evening’s discussion was just one point along a much broader conversation, offering unique perspectives and perhaps raising as many questions as it answered. But a shared sentiment among the panelists and crowd can be summed up in Randy Rollison’s words. This post also appeared on the Americans for the Arts ARTSblog. Many thanks to Tim Mikulski. For anyone just starting out in the public art world, it can seem tempting to take any commission you can get. No doubt it is competitive out there, and there may be dozens of people applying for the same calls for proposals. Before you do, think twice — and come prepared. Here are the top ten tips that I took away from the seminar. You will only receive 15 to 20 percent of the commission budget. For example, if the budget is $30,000, you will receive $4,500 for the entire duration of the project, from design to fabrication through execution. The lower the commission, the lower the artist fee. Your ideas are yours, not the city’s. When you present your proposal, put your name, copyright, and date on every page and slide. By doing this, you prevent others who may borrow or “appropriate” your idea to be built by someone else. 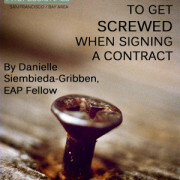 If you are working with fabricators, do not sign any contracts with them until your own contract is finalized. Some fabricators may charge you for their design time and, if you end up losing a contract, you will have to pay them anyway. Most likely you will get paid on a time schedule with different payouts for different benchmarks. When this happens, front load the payment so you don’t get stuck with big fabrication bills at the end. Title vs. copyright. Never sign your copyright off to the city. You own that! Remember Prince? He had to change his name to a symbol to get out of a copyright dispute. Site compliance. The city shall be responsible for all expenses, labor, and equipment to prepare the site for the timely transportation and installation of artwork. Insurance. Yes, you need it. You’ll primarily need liability insurance until your work is installed, and then it is the city’s responsibility. Where did you get that model? If you use an image of a person, place, etc. in your work, make sure to get a release from them. Site credit. Don’t you hate it when you see an amazing piece of public art work but have no idea who did it? Make sure the city pays (not out of your budget) for a plaque or credit site near the work with your name on it. Budget. These budgets are the hardest. It takes a lot of time to put one together, but they are very important. Call around to fabricators to see the realistic cost for your project. If it’s out of scope, think about scaling down. Also, call a public art manager to see if they have any input. There are many other ways to look at your public art contract. 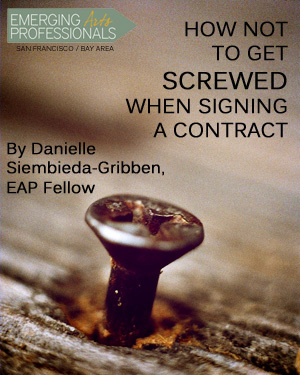 If you are nervous about confronting a city or other entity about the contract, keep in mind they have chosen you out of all the applicants, and are set on making the project work just as much as you are. Make sure to check out the downloadable public art contract templates and resources, and let us know in the comments if you have any contract advice or horror stories to share.